- A line that divides the court into two sides. - An area inside the court where the inner players are stationed during service. - An area inside the court where the Tekong (Server) positions himself during service. - The Area outside the court between the edge of the court lines and the A-Board. - An “A” shaped low advertising board placed around the court away from the court lines. - A cylindrical upright bar made of strong material to be used to hold the net firmly. - Referred to as a group and it may be composed of two or three Players. - Regu in a team event referred to as 1st Regu, 2nd Regu and 3rd Regu. - A leader of a regu who wears an armband on the left upper arm. - A player also known as “Server” that serves the ball. - The opposite regu in a match. - Neither home nor away site. - An image appearing on a jersey to promote the manufacturer or sponsor. - An act of replacing one player with another. - An act of naming one or two players as a reserve(s). - A player who may be used to replace another player in the regu, also knows as substitute. - Physical disability as a result of a fall or accident rendering the player unable to continue play. - It is a result classified as forfeiture or disqualification in a game. - The player inside the quarter circle to the left of the tekong during service. - The player inside the quarter circle to the right of the tekong during service. - An announcement by the Referee at a point in time when the score is 20-20. The match shall continue until one regu attains a lead of two points or the match ends at score of 25-24, whichever comes first. - A lawful action following an execution of an aerial kick or a block that causes any part of the body to cross above or under the net. However, if any part of the player’s body crosses above or under the net before contact with the ball, such motion is not a follow through and is therefore, illegal. Words depicting the male gender in this rule and regulations shall include the female gender. The court dimension of 13.4m (metres) x 6.1m free from all obstacles up to the height of 8m measured from the floor surface. The width of the lines bordering the court should not be more than 0.04m measured and drawn inwards from the edge of the court measurements. The Centre Line of 0.02m shall be drawn at the centre of the court equally marking the right side and left side of the court. At both ends of the Centre Line, the Quarter Circle shall be drawn from the sidelines measuring a radius of 0.9m. 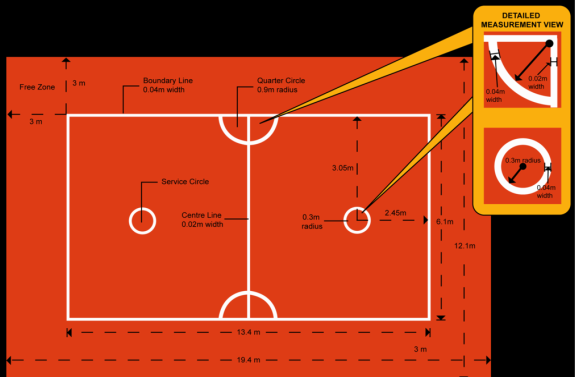 The Service Circle shall be 0.3m radius drawn on the left and right sides of the court, the centre of which must be 2.45m from the back line and 3.05 metre from the sidelines of the court. The width of the Service Circle shall be 0.04m. The court shall have an area, clear of any obstructions within 3.0m away from the sidelines and the baselines. 2.1 The posts shall be 1.55m for men and 1.45m for women in height from the floor and must stand firmly to maintain high net tension. It should be made with very strong materials and shall not be more than 0.04m in radius. 2.2 The position of the posts shall be erected firmly 0.3m away from the sidelines and shall be in line with the Centre Line. 3.1 The net shall be made of fine nylon cord with a mesh of 0.06m to 0.08m. 3.2 The net is 0.7m in width and must not be shorter than 6.1m in length placed vertically over the axis of the Centre Line. 3.3 Two side bands of 0.05m wide shall be fastened vertically to the net and placed above each sideline. These are considered part of the net. 3.4 The net shall be edged with a 0.05m wide tape, doubled at the top and bottom. It must be supported by a fine cable that runs through the tape, strains over and flushes at the top of the post. 3.5 The height of the net at the centre of the court shall be 1.52m for men and 1.42m for women while the height at the posts shall be 1.55m for men and 1.45m for women. 4.1 The Sepaktakraw ball shall be spherical in shape and, made of synthetic fiber with one woven layer. 4.2 A Sepaktakraw ball without synthetic rubber covering shall consist of the following characteristics? 4.2.3 Have a circumference measuring from 0.41m to 0.43m for men and from 0.42m to 0.44m for women. 4.2.4 Have a weight that ranges from 170g (grams) to 180g for men and from 150g to 160g for women. 4.3 The Sepaktakraw ball can be single coloured, multi-coloured, or luminous, provided the colour will not inhibit the performance of the players. 4.4 The covering of the Sepaktakraw ball can also be made of synthetic rubber or soft durable material to soften the impact of the ball on the player’s body. The type of material and method used in making the ball shall be approved by ISTAF before it can be used in any competition. 5.1 A match is played by two groups, referred to as a “Regu” or “Regus”, each consisting of three players. 5.3 The other two players shall be in front, one on the left and the other on the right. The player on the left is called a “Left Inside” and the player on the right is called a “Right Inside”. Both are referred to as “Inside” players. 5.4.1 Each team, referred to as “Team” shall comprise three Regus, and shall consist of a minimum of nine players and a maximum of twelve players. 5.4.2 Each player shall be registered in order to participate in any competition. 5.4.3 A maximum of three players shall be registered as part of the team’s “reserve pool”. Players in the reserve pool may be fielded only as substitutes. 5.4.4 Each player shall be permitted to play for only one Regu in any Team Match. 5.4.5 Prior to the start of a game, each team must have a minimum of nine registered players present on the playing court. 5.4.6 Any team with less than nine players shall not be permitted to play the game and shall be disqualified. 5.5.1 Each Regu shall consist of a minimum of three players and a maximum of five players (1 Regu of 3 players plus 2 reserves) all of whom must be registered. 5.5.2 Prior to the start of the game, each Regu must have at least three players present on the playing court. 5.5.3 Any Regu with less than three players shall not be permitted to play the game and shall be disqualified. an unfair advantage or endangers himself or other players shall not be permitted. 6.2 The opposing teams shall wear jerseys of a different colour. 6.3 A team shall have a minimum of two sets of jerseys of different colour. If both teams are wearing the same colour jerseys, than the home team shall change. When the match is played in a neutral venue, the team listed first on the match program shall make the change. 6.4 A player’s attire consists of a jersey, shorts, socks and sport shoes with rubber soles without heels. The entire apparel of a player is regarded as part of his body. All jerseys shall be properly tucked in prior to the start of the match. 6.5 All jersey shall be numbered on both the front and back. A player shall be assigned only one number from 1 to 36 throughout a tournament. 6.6 The numbers shall not be less than 19 cm (centimetres) in height on the back, and not less than 10 cm in height on the front within the chest area. 6.7 The name of the player or the country he represents shall be printed on the back of the jersey above the number and must be clearly visible. 6.8 Jerseys may carry a sponsor’s logo subject to tournament regulations. 6.9 The jersey manufacturer logo may appear on any player apparel at approved size. 6.10 The Captain of each Regu shall wear an armband on the left upper arm. Its color must be a different color from the jersey. 6.11 Any other apparel not specifically mentioned in these Law of the Game shall have to be approved by ISTAF. 7.1 Players are not allowed to play in more than one Regu in any Team Event. Substitution Card shall indicate the jersey number of the outgoing player. Team and Regu event competitions. for any match, in addition to three players. three reserve players in a Regu. 7.5.3 The remaining reserve players may be fielded in the next Regu. already fielded all their three reserve players. finished the previous set, each change is considered as a substitution. the game and shall be considered as having lost. be considered as having lost. (ii) Choose which side of the court to start the match from. allowed to move freely in the court with the official ball. respective courts in a ready position. placed freely anywhere during the service. 9.4 The opponent or receiving Regu is free to be anywhere within its court. Asisstant Referee along the side-line. 10.2 The Referee is supported off court by an Official Referee. by the opposing Regu which shall also serve three consecutive times. approved part of the body and vice versa unintentionally. 10.8 Players shall change sides before the start of each set. given. A repetition of this act shall be considered a Fault. done within the period of fifteen seconds. shall be allowed to move about freely in their respective courts. lines of the opponent’s court. the 3rd Regu if a winner has been decided. 11.1.1 The Inside Player making service throws, plays about with the ball (throwing up the ball, bumping, giving to other Inside player,etc.) after the call of the score has been made by the Referee. 11.1.2 Any of the Inside Players lifts his foot, steps on the Quarter Circle or Centre Line or crosses over or touches the net while the ball is being thrown for service. 11.1.3 The Server still not in ready position after the 15 second Rule, for the second time. 1.1.1 During the execution of the service, The Tekong’s non-kicking foot is lifted off the floor prior to the kicking foot’s contact with the ball, or the non-kicking foot steps completely out of the Service Circle. 1.1.2 The Tekong does not kick the ball on the service throw. 1.1.3 The ball touches his own player before crossing the net. 1.1.4 The ball goes over the net but lands outside the court. 1.1.5 The ball fails to cross the net. 1.1.6 A player uses his hand or hands, or any other part of his arms to support the execution of a kick even if the hand or arm does not directly touches the ball, but it touches other objects or surfaces instead. 1.1.7 The Thrower of the serving Regu throws the ball before the Referee calls the score for the second or subsequent time during the match. 11.2.1 Deliberately creating distractions by shouting, making noises or gesturing at the opponent after the Referee calls the score. 11.3.1 Touching the ball on the opponent side. 11.3.2 Any part of player’s body crossing over into opponent’s court whether above or under the net except during the “followthrough”. 11.3.3 Playing the ball more than 3 times in succession. 11.3.4 The ball touches the player’s arm. 11.3.5 Stopping or holding the ball under the arm, between the legs or body. 11.3.6 Any part of the body or player’s outfits e.g. shoes, jersey, head band etc., that touches the net or the post or the Referee’s chairs or falls into the opponent?s side. 11.3.7 The ball touches the roof, wall or any object except the net. 11.3.8 Any player using the aid of any external object as a form of support to facilitate the execution of a kick. 12.1 When either the serving or receiving Regu commits a fault, a point is awarded to the opponent. 12.2 Each set is won by the Regu which scores twenty-one (21) points with a minimum lead of two points. 12.3 In the event of a score of 20-20, the set shall be won by the side which gets a lead of two (2) points, or when a side reaches twenty-five (25) points, whichever occurs first. In such a situation, the Referee shall announce “Setting up to twenty-five (25) points”. 12.4 Each match shall be determined on the basis of a best of three sets format, with two minute breaks in between sets. Sets shall be referred to as the first, second and third. The Regu which wins two sets first, shall be declared the winner of the match. 13.1 Each Regu shall be entitled to one time-out for a period of not exceeding one minute in each set. 13.2 Only the Team Manager or the Coach may call for time-out only when the ball is not in play. 13.3 Only two persons of different outfits from the playing Regu shall be allowed at the baseline during time-out and break. 14.1 The Referee may suspend play temporarily for not exceeding five minutes for each Regu in the event that a player is injured and required immediate medical attention. 14.2 An injured player shall be allowed up to five minutes of injury time. If after five minutes, he is unable to continue play, a substitution shall be made. However, if the injured player’s Regu has already made two substitutions earlier, the match shall be awarded to the opponent. An injury time shall not exceed 5 minutes in total per Regu. 14.3 In the event of obstructions, disturbances or disruptions, only the Official Referee may suspend the match after consulting the Tournament Committee. 14.4 Following a match suspension, all players shall not be allowed to leave the court except with the expressed permission of the Official Referee. 15.1 All players and team officials shall abide by the Law of the Game. 15.2 Only the Captain of the Regu is allowed to approach the Referee during the game to request an explanation concerning the latter decision in the match. 15.3 Any Team Official or Player who disputes the Referee’s decision during the match or acts in any manner that jeopardizes the smooth running of the match, shall be regarded as having committed a serious breach of discipline, and disciplinary action shall be taken against him. A player who is cautioned shall be shown the Yellow Card if he commits any of the following offences? 16.1.1 Ungentlemanly conducts detrimental to the proper conduct of the game. 16.1.2 Shows dissent to Match Officials by word or action. 16.1.3 Repeated Infringement during the game. 16.1.4 Delaying the start of play. 16.1.5 Entering or leaving the court without the Referee’s permission. A player is shown a Red Card and sent off if he commits any of the following offences? 16.2.2 Violent conduct including any act with intent to cause injury to the opponent or any other person. 16.2.3 Spitting at an opponent or any other person. 16.2.4 Use of abusive language or gesture. 16.2.5 Shown the Yellow Card for the second time in the same match. Third Yellow Card received after suspension for the first two Yellow Cards in the tournament. • A fine of US$100 (One Hundred Dollars) to be paid by the club, association or federation which the player represented. Yellow card received after two-match suspension for the earlier Third Yellow Card in the same tournament. relevant Sepaktakraw controlling authority until the Disciplinary Committee makes the decision. • A Red Card shall be given for a third offence committed in any other matches in the tournament. 16.4.1 The Red Card is shown a player who commits a Sending-off Offence (Rule 16.2) either on or off the court, towards any opponent, team-mate, Match Officials or any other person during the match. 17.1 Disciplinary action shall be taken against any Team Official and/or members of his team for any act of misconduct committed during a tournament whether inside or outside the court. 17.2 Any Team Official who misbehaves or creates disturbances shall be immediately escorted out of the arena by the Tournament Officials and the Official Referee, and will also be immediately suspended from his appointment being a Team Official until a Disciplinary Committee makes the decision. 17.3 A Team Official who has committed a breach of discipline, shall be dealt with in accordance with Rule 16.4. 18.1. Any matter not expressly provided for in these Rules of the Game shall be refereed to the Council of the respective association or federation. 18 September 2013 in Udonthani, Thailand.